Attempts at Comet Lovejoy: At Glen Major again. On January 12, I went up to Glen Major again to try my hand at imaging the comet again. It was cold as always, but that didn’t stop me. I quickly assembled and aligned my telescope to my two favorite stars, Betelgeuse and Polaris. Before I tried imaging the comet again, I decided to take 10 images of the Orion Nebula to stack back home. The result was not good. The images turned out to be blurry, and unfocused. It’s disappointing. In the future, I need to figure out why it is so unfocused. Maybe the telescope needs to acclimatize to the ambient temperature (-20 C :P). Maybe there is a problem with the mirrors. Whatever the case, I need to find a solution. I then began searching for the comet using my camera. I started taking pictures of the sky to try and find the comet, but I noticed the pictures displaying signs of trailing, which meant that the mount became too cold to operate properly, which led me to pack up and go back home. Before going home, I was able to image the cityscape on the road to Clairemont. It was beautiful, but imaging it was difficult. After that, I went back home. I may have not captured any good image that day, but on January 14th, I was able to image a close approach of Venus and Mercury from my bedroom. Here is the picture below. 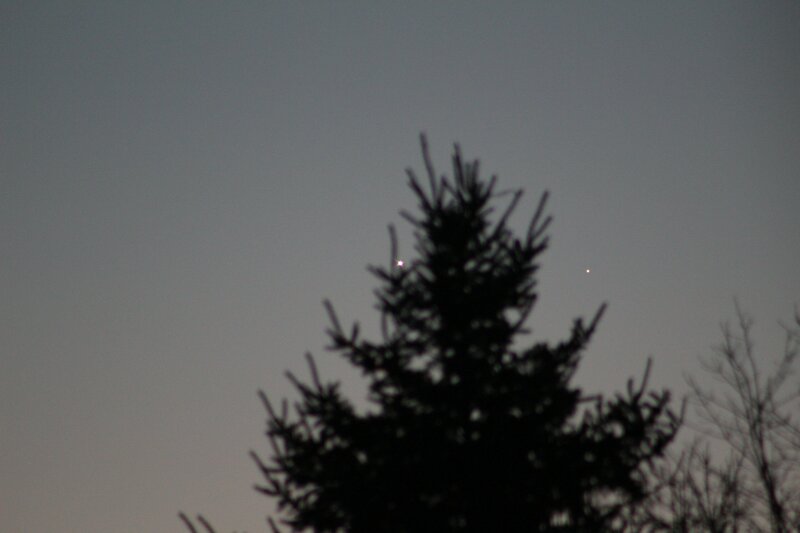 Venus is snuggling beside the tree, and Mercury is a step away from the tree. Keep Looking Up. You never know what you will find. On January 9/10, 2015, my father and I decided to go to Glen Major Forest to image the comet. It was -13 C that night, with windchill making it worse. Within a few minutes of arriving, we started setting up the telescope outside. We quickly aligned the telescope to the Moon, and we saw the majesty of the Moon up close. We tested the mount’s tracking capabilites by letting the telescope track the Moon, and it was successful. We decided to move towards Jupiter next, and we stayed there. However, it started to drift greatly. This gave us the theory that the planetary alignment is only good as long as the telescope doesn’t move around. It was a revelation. We then begin to realign using the Two Star Alignment method. We aligned the scope to Betelgeuse, and Polaris, but the mount started to slow down at top speed. Having been exposed to the cold for over an hour, the motor started to freeze, and soon enough froze all together. Luckily, we brought two telescope mounts with us, and we debated whether to switch out the mounts. Eventually we did, but when it came time to align the telescope, the mount did not respond to my commands. It was heartbreaking for me. Our second chance at imaging the night sky failed for some reason. After that, I took a few random pictures, and then we quickly packed up and left. That session went really badly. I didn’t get any good pictures that night. The only thing I took away from that night is that Solar System Alignment is only good for planetary observing. The next time I go outside, I will not make that mistake again.